Both 1 percent and 2 percent milk are good sources of nutrients, including protein, calcium, vitamin D and others. However, because of its higher saturated fat content, 2 percent milk is a less-healthy beverage choice than 1 percent milk for people over the age of 2. According to the American Heart Association (AHA), 1 percent milk provides slightly more nutrients than 2 percent milk, while also containing less calories, fat, saturated fat and cholesterol. While both are good sources of protein and calcium, 1 cup of 1 percent milk contains 0.17 g more protein, 12 mg more calcium and about half the fat compared to the same amount of 2 percent milk, according to figures from the USDA National Nutrient Database for Standard Reference. Fortified 1 percent and 2 percent milk both provide vitamin D, although due to its lower saturated fat content, 1 percent milk is a healthier supplier of this nutrient. For heart health, the AHA recommends adults and children have two to three servings of nonfat or low-fat dairy per day. Foods that meet these recommendations include skim milk and 1 percent milk, but they exclude 2 percent milk. Two-percent milk and other foods that contain a lot of saturated fat are the largest dietary contributors to elevated blood cholesterol levels, a risk factor for heart disease, according to the AHA. Even 1 percent milk contains some saturated fat – 1 cup has 1.55 g -- which makes fat-free milk the most heart-healthy choice when it comes to dairy. If you're used to drinking whole milk or 2 percent milk, the AHA recommends tapering slowly to 1 percent milk, followed by 1/2 percent, and finally drinking only skim milk. While 1 percent milk is a healthier choice for adults, 2 percent milk is a suitable choice for very young children. According to pediatrician Dr. William Sears, a baby can switch from drinking whole milk to 2 percent milk at around age 2 rather than continuing to drink whole milk into his toddler years. Although toddlers need high-fat foods in their diets, they need to get some of their fats from healthy sources, such as seafood fats, as opposed to saturated fat from whole milk. Sears recommends against substituting fat-free or low-fat milk in an infant or toddler's diet, however. 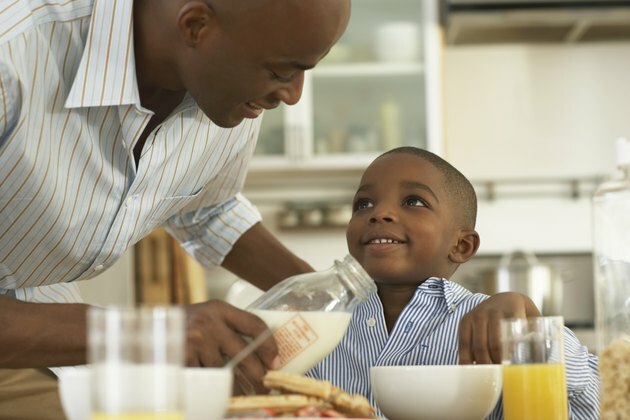 After toddler-hood, 1 percent or skim milk is a healthier choice for your child's nutrition than 2 percent milk. While 2 percent milk is excessively high in saturated fat, 1 percent milk is a good source of nutrition.. It provides all of the components of a healthy meal: carbohydrates, protein and a little bit of fat. Furthermore, of its calcium and vitamin D content, 1 percent milk is an important food for preventing the bone disease osteoporosis, particularly in women. Some research, including a study published in "Annals of Nutrition and Metabolism" in 2010, has also linked increased consumption of dietary calcium from dairy sources to weight loss in overweight women. When Can a Toddler Switch From Whole Milk to 2 Percent? Why Am I Craving Milk?